Gardeners know its red fluffy flowers. Vegetarians know the grain as a complete protein and people with celiac know it is one of the gluten-free grains. The bright red leaves are also edible. When the leaves are small and new they can be eaten raw in a salad like lettuce. As the leaves get larger and a little tougher, they are more flavorful and can be cooked like spinach. The plants themselves are beautiful bright red additions to the garden. Amaranth seeds can be popped like corn or puffed rice. Companies trying to preserve the nutritional value after the heating process have developed a way to pop amaranth seeds in bulk using hot air somewhat like an air popper for popcorn. Another study found that amaranth can help decrease atherosclerosis and other kinds of cardiovascular disease. 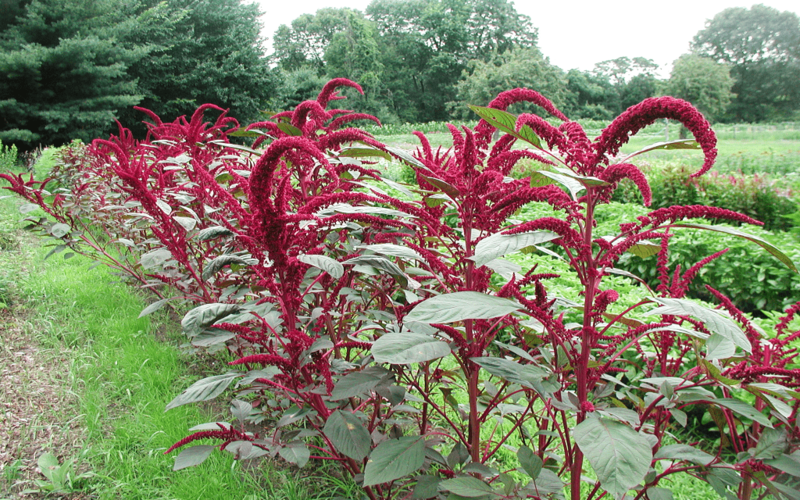 Researchers concluded by focusing on the way amaranth positively affects the proteins and cells associated with certain pathways in the cardiovascular system. Whether you grow amaranth for the leaves, the grain or the beauty, it is a great plant for gardens where water is at a premium. Once the seeds have started the plants are quite drought tolerant. Reports vary but it does not seem to be deer resistant.